It’s just one way the City and local organizations are trying to make the homeless feel at home. On nights when the temperature sinks to 40 degrees or below, a group of about 50 men and women gather at 501 North 9th Street, within view of the John Marshall Courthouse. At 7:00 PM, those men and women file into the building, make an immediate right, and enter into a large room where on the floor are 55 foam mats, each twice the thickness of a typical yoga mat, and blankets. This is where they’ll sleep for the night. Down the hall from the sleeping quarters are bathrooms shared between men and women. Those who stay the night are only permitted to smoke during two smoke breaks. The displaced men and women, many of whom use their satchel or backpack for pillows, sleep while a security guard and three volunteers from CARITAS, a local housing and rehabilitation nonprofit that oversees the overflow shelter, keep watch. The following morning at 6:00 AM, the men and women rise, help put their mats back into the closet, and file back out onto 9th Street the way they came. “The reason why it’s so early in the morning that we dismiss [them], not only just to make sure they’re up and out of the building, but also because the feeding time [at local shelters] is between 6:00 – 9:00 AM,” Yancey said. “So there’s just a very small window of time for them to get to the feeding places.” Several men and women catch a bus at a nearby GRTC stop. “This is the first year, per se, that the city has offered an overflow shelter under the auspices of the city. Before it was offered by the churches,” Yancey said. “Six Mount Zion [Baptist Church] served us well for a number of years, and they have been the site where folks could just go. So they would see numbers between 90 – 100 folks per night. That was truly a tremendous effort for them.” Six Mount Zion declined to extend their contract with the City, so Social Services took on overflow shelter duties with the assistance of CARITAS. Here in the city, the number of people now frequenting the overflow shelter nightly closes in on the 55-person capacity. “This year we’re seeing numbers at about 50, 51 so we’re almost right there, and we’ve had some pretty cold temperatures…so I think we’re pretty much at our peak,” Yancey said. A last resort during frigid weather, the Overflow Shelter is only a small part of the resources available to Richmond’s displaced. “The homeless shelters have a much larger and broader program in place where they’re housing folks for much longer periods,” Yancey said. One of the those shelters is the City’s overflow partner, CARITAS. “We are the largest homeless service organization [in Richmond],” said Karen Stanley, CEO of the nonprofit, which for the past 25 years has helped families find shelter, employment, and recover from addiction. Its shelter offers 110 beds, with an additional 20 beds located at The Healing Place, its addiction-recovery facility. 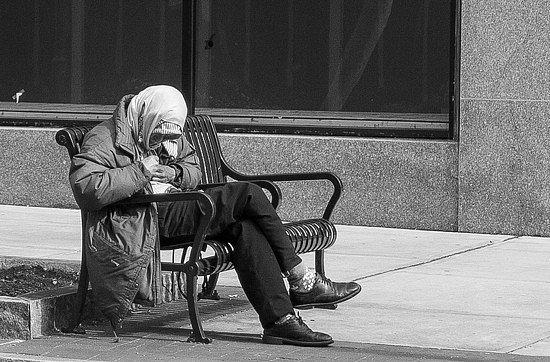 In 2004, Commonwealth Catholic Charities created the Homeless Point of Entry. Located at 511 W. Grace Street, the entry point allows volunteers to conduct an intake process for homeless individuals and families to find out what services they may need and to direct them to those services. Fnding shelter for individuals and families is only part of how the City and local organizations try to ebb homelessness. In addition to the rehabilitative services that agencies like CARITAS provide, the new Center for Workforce Innovation will help individuals learn a trade and find employment. “It’s one our newest initiatives where we are helping individuals who are displaced, unemployed to get to permanent employment as well,” Yancey said. She added that participants in the federal Supplemental Nutrition Assistance Program (SNAP), which replaced the Food Stamps program, also qualify for a supplemental employment and training program. Yancey said displaced Richmonders in the SNAP program can use the new Center for Workforce Innovation Center to learn a trade. The City then connects them with local employers for jobs. It’s a lofty ideal, one that will undoubtedly work for many in the coming years. But Richmond, like all urban cities, will always have homeless individuals who ask for change and food, but who’ll never ask for the services both the City and its charities provide. Richmonders can let the homeless know that Richmond is here, by donating to both the City and local organizations like CARITAS. In addition to providing addiction-recovery and sheltering services, CARITAS also operates a furniture bank it uses as stock for rehoused individuals. “We repurpose everything we can get our hands on, including mattresses,” Stanley said. Mattresses go through a bed bug oven before being passed along. “Our furniture is at a critical low,” she said. She asked that Richmonders with unneeded furniture to please donate those items, adding that CARITAS can pick up those items. Angelia Yancey of the City’s Department of Social Services said that the area’s homeless and Overflow Shelter can also benefit from people’s generosity. “We’d love it if they would be willing to provide hats, gloves, scarves, so when [the homeless] leave here at 6:00 AM they are able to cover their heads to keep their body heat and body temperatures [up] and they’re able to go out into the elements and not be harmed,” Yancey said. People may bring donations to 900 E. Marshall Street during regular business hours. Yancey believes people can sometimes be too quick to assume they know what caused a person’s homelessness.